The Subaru Love Promise is just that. A promise. It is a promise to do right by our community by partnering with nonprofit education, health, community, environment, and animal organizations - to set us apart through our deeds. To be unlike any other car company by doing what is right and good, just for the sake of doing it. Loving the environment means more than loving the great outdoors. It means working to preserve it. Here at Tri-City Subaru, we are committed to making a big difference in protecting and enhancing the environment that surrounds us. That being said, Tri-City is excited to partner with SELT for the Stonehouse Pond / Stonehouse Forest project in Barrington NH. SELT recently acquired 1,500 acres adjacent to the Pond that will ultimately all be unified into one very large parcel for conservation and recreational use. SELT is working with conservation specialists to identify areas and species in the forest to first and foremost protect. Once those sensitive areas are identified SELT will be working with the NH Fish & Game Department to expand available parking and outline a trail network throughout the property. Some older trails exist while others will need to be developed and marked. Tri-City is looking forward to volunteer days with the SELT land management team, tasks will include removing invasive species, marking and maintaining trails, and cutting new trails as directed. This is a great relationship connecting Tri-City's "Subaru Loves the Earth" initiative with a big land conservation project that will be recreationally usable for the public to enjoy. A small group of us went over on a Monday afternoon in September and cleaned leaves, sticks, brush from the new trail system we cut earlier this summer. A new connecting trail is now open from the parking lot with a brand new bridge. SELT has also recently installed trail markers on the trees. The new trail ends with the beautiful view high atop the rock cliffs. The trail is more than ready for some happy hikers. commitment to SELT and the Stonehouse Forest project a group of employee volunteers gathered at Stonehouse Pond, Barrington NH on a Sunday morning in July to clear debris from a newly cut trail. Battling the heat, humidity and nest of pesky stinging bees the volunteer crew conquered the winding trail all the way to the top. Land managers are in the process of redirecting hiking traffic away from an old trail located in the riparian zone, or water's edge. The old trail was created by recreational users and not by landowners. It is too close to the water's edge impacting wildlife habitats, contributing to erosion and is poorly routed staying muddy throughout most of the year. The newly cleared tail treks thru higher ground of hemlock and hardwood forest and leads to a beautiful rock ledge overlooking the pond and surrounding hills. With the trail debris now cleared recreational users can begin using the new trail and land managers can begin closing the old trail along the water's edge. SELT (South East Land Trust) was Tri-City's 2017/2018 'Share The Love' partner and Tri-City continues to work with them to expand the recreational use of the land and supporting efforts to conserve it for future generations. Tri-City Subaru employees along with local SELT'ies joined forces to celebrate Earth Day 2018 at Stonehouse Pond in Barrington NH. The morning kicked off with a trailhead kiosk dedication to Tri-City Subaru and a check presentation to SELT for the funds generated during the Share The Love campaign. The event raised $29,347 that will go directly to the Stonehouse Forest project to help preserve & protect it. After the ceremony the Tri-City crew and SELT volunteers were ready to work! One group worked alongside the entry road pickup up litter and debris. The remaining volunteers headed into the woods and were a force to be reckoned with, like a swarm of worker bees, the entirety of a new recreation trail was cleared of logs, sticks, undergrowth and raked clean in a matter of hours. It was a wonderful spring day, beautiful 55 degrees and sunny, an excellent way to spend Earth Day and give back. There are more Tri-City volunteer days coming this summer, we would love you to come out an join us for our next Stonehouse Forest adventure. Want to do more with SELT and Tri-City? Stay tuned for updates! Tri-City has committed to several Stonehouse Forest work days this Summer & Fall and we will be looking for volunteers to get down and dirty building & maintaining trails, removing invasive species and other work to protect this land for generations to come. 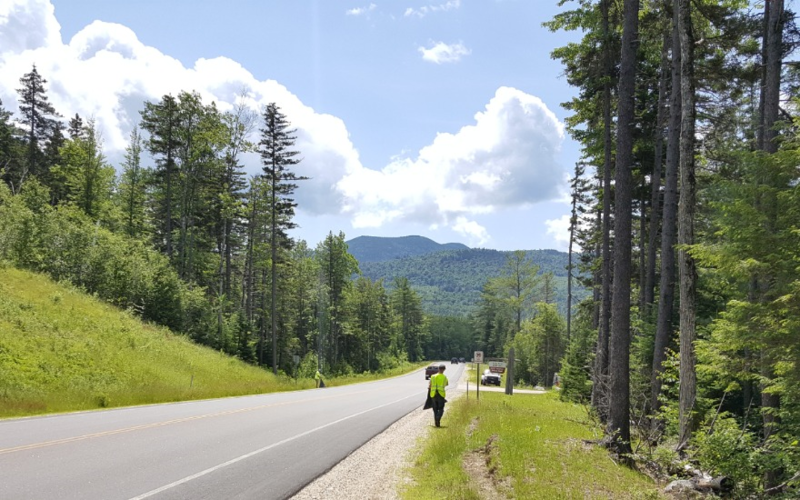 In June 2017 Tri-City hosted a Kancamangus Highway Clean-Up Event in the beautiful White Mountain National Forest. To help insure these protected lands are beautiful for generations to come Tri-City sent a group of employee volunteers to clean-up trash along the famous Kancamagus Highway on what turned out to be a gorgeous sunny day in the White Mountains. After a morning briefing at the Saco Ranger station the volunteers got geared up and hit the road picking up litter and debris. By midafternoon the volunteers had covered over 6 miles of the Kancamagus Highway and collected 30 bags of trash. Thank you to all our volunteers and to the White Mountain National Forest for assisting this effort. This is a prestigious award granted to Subaru dealers with the highest levels of dedication to BOTH Customer AND Community. We thank and congratulate our employees for helping us achieve this elite level!